Karen Barbouttis's art practice has been a natural development from her years working in cartoon animation and illustration. While completing a degree in Psychology, Karen sought employment at the Hanna Barbera Studios in Sydney where she was trained in animation, as an animator. This was a field in which she continued to work over the next twenty-five years, working in various studios in both Sydney and Melbourne, such as The Disney Studios, Yoram Gross Studios, Burbank, Unlimited Energee, Energee Entertainment, and Mickey Duck Studios. Karen also worked in concept art, creating and designing both finished art and merchandise for companies in the United States, such as Harveytoons, Warner Brothers, and Ringling Brothers and Barnum and Bailey Circus. Working in book illustration, one of her collaborations with Dr Sandra Cabot resulted in a series of books that made the best selling lists across Australia. After completing a Bachelor of Fine Arts Degree at the National Art School, Sydney, in 2010, she made the decision to make drawing her principal choice of medium. Soon after graduating she won the prestigious Adelaide Perry Prize for drawing in Sydney, Australia with a work titled "Weekly Reports: Drawings from the Museum of Life". This work took the form of an old ledger sourced from a second-hand shop in which Barbouttis drew museum specimens of animals. The work was then presented to the audience mounted on a timber lectern giving the whole work a sense of being an antique treasure. 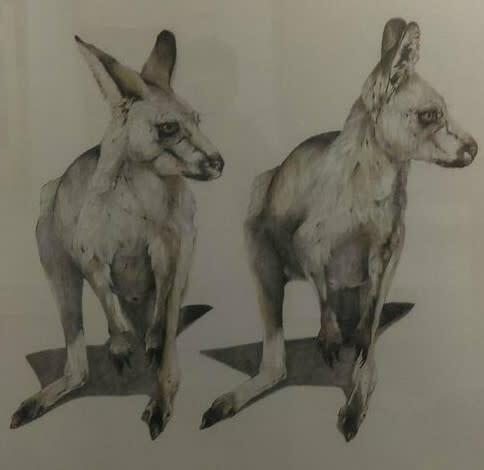 Following on from that success she continued to work with the theme of animals making drawn research studies in situ to provide her with information to take back to her studio where she makes larger precise drawings of her subject. Karen's current work explores Life and Death, drawing the animals she encounters in her every day life, whether it be the birds she passes in her daily walk down to the local shops in Rose Bay, Australia, the museum specimens in the Museum of Natural History in New York or the stray dogs of Greece lounging in the Winter sun in Syntagma Square, Athens. "I draw what I see".